"Scraping Bing Local just got easy." Bing Local is constantly trying to improve to compete with the largest local business sites, which is why you should not over look having a Bing Local scraper. Bing has also started to give out information that other sites have yet to. Did you know you could find the Facebook address of a business by using Bing Local? How much better would your database be if you also had the Facebook site of each business. That is why its important to have a Bing Local scraper. 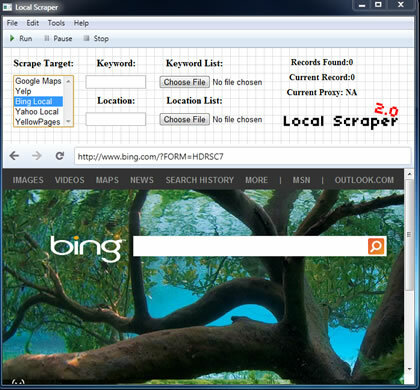 What is even better is that Local Scraper contains 9 data scrapers for the most popular business listing websites, Bing Local included. In just a matter of minutes you could be in control of your very own data scraping robot adding the valuable data from Bing Local to your databases, curious to know more? Click the button below to learn more about how data scraping can grow your business.